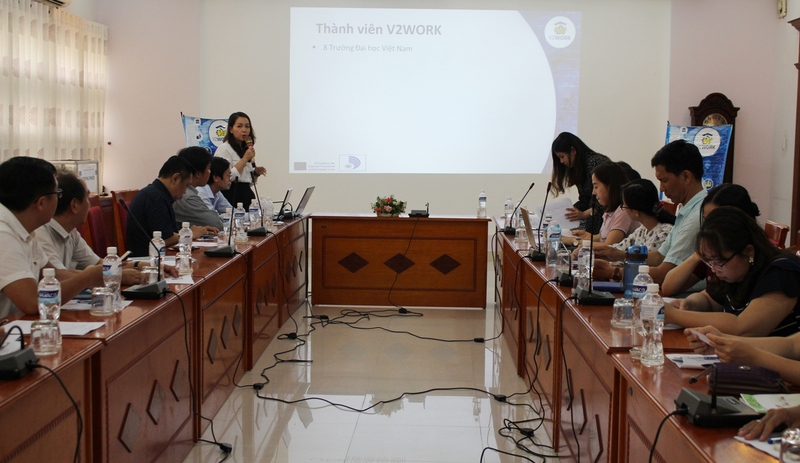 In March, 2019, the V2WORK Project Management Board the University of Danang (UD) in coordination with University of Technology and Education, the University of Danang (UTE-UD) organized the Replication workshop to retrain the contents of Training of Trainers (TOT) in the framwork of V2WORK Project. The purpose of the replication workshops was to provide information and share experiences trained on implementing activities to provide job opportunities and entrepreneurship for students. Participating in the Workshop was nearly 50 delegates who were leaders, officials, lecturers and students of the UTE-UD. On behalf of the Project Management Board, Assoc.Prof.Dr. 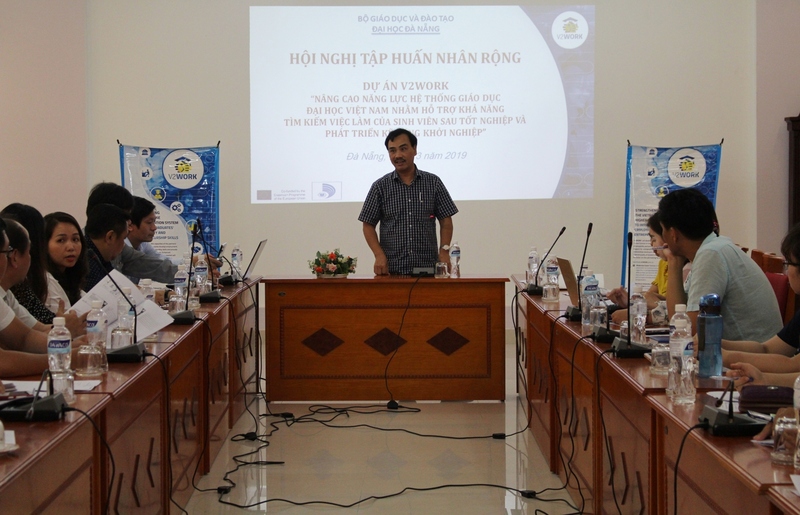 Vo Trung Hung delivered the opening speech of the Workshops. In the speech, he emphasized the mission of universities "besides the mission of spreading knowledge (through teaching), innovating new knowledge (through research activities), serving the community (through social services and criticism), universities must have a mission to provide students with job opportunities and entrepreneurship". In that spirit, the V2WORK project must be implemented through practical activities that contribute to the development of student skills, providing information and new services to provide good employment and entrepreneurship opportunities to students. On behalf of leaders of UTE-UD, Assoc.Prof.Dr. 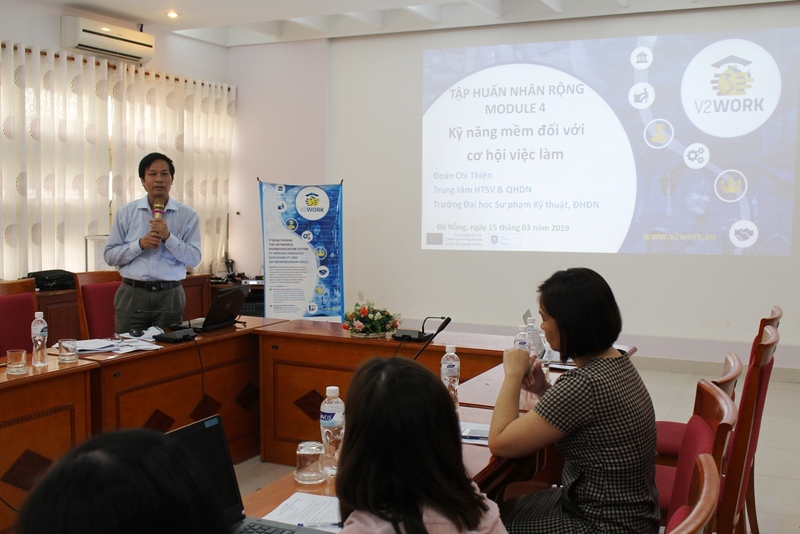 Phan Cao Tho, Rector, thanked the Project Management Board of the Project for organizing the Replication workshop at the University and committed to coordinate and provide maximum support for the project to successfully implement project activities. 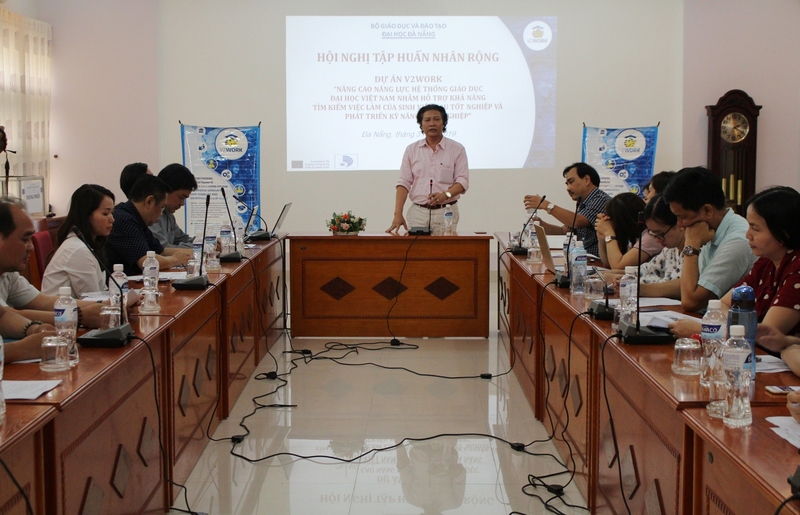 At the workshops, the members of the project trained 03 previously trained topics (by European experts) for the university's officials and students. Topics are presented and discussed including: • Topic 1: Labor market analysis, work and employment • Topic 2: Developing entrepreneurship and marketing skills • Topic 3: Soft skills training, job preparation, internship opportunities The lecturers and students participating in the workshop discussed and proposed many ideas to contribute to improving the quality of training and developing new services to support students in internship, part time job, entrepreneurship after graduation.